Calvus Horatius is an Imperial warrior, and a Mercenary for hire. He can be found in the Royal Palace Courtyard, if you wish to hire him. Calvus' mercenary services can be bought at the rate of 250 gold for 30 days. If you hire him he will become a permanent follower until the contract expires. You can check how much longer your current contract is valid for by speaking to Calvus about the topic contract. He can be equipped with better armor and weapons, making most efficient use of long blades or blunt weapons, shields, and heavy or medium armor. While in combat, he'll use any potions you give him. When he is wounded, he will generally need to be healed by you, with a Heal Companion spell, or allowed to rest. To find out if he is injured, simply enter dialogue with him and select keep me healthy. He will rest when you do, being healed in the process. Calvus begins wearing an Imperial chain cuirass and Imperial chain greaves, as well as netch leather boots and a steel tower shield. He also wears common pants and a matching pair of common gloves. He wields an Imperial broadsword. Of course, if you hire him, you can change all of his equipment at will. Aside from his natural charm and ability to absorb fatigue from others, he knows the spell Balyna's Perfect Balm. "If you're looking for someone to watch your back, I'm available for hire." "What do you need, %PCName? Do you want to change the plan? Or were you thinking you'd like to improve my effectiveness?" "Hello again, %PCName. As you can see, I'm once again available for hire." "I like a little workout, %PCName. But I'm wounded, and you want to keep me at full health. Is there anything else on your mind? Do you want to change the plan? Or were you thinking you'd like to improve my effectiveness?" "I'm wounded. Heal me, or let's get some rest so I can get back to full health. Is there anything else on your mind? Do you want to change the plan? Or were you thinking you'd like to improve my effectiveness?" "I'm badly wounded. Heal me, or let's get some rest so I can get back to full health. Is there anything else on your mind? Do you want to change the plan? Or were you thinking you'd like to improve my effectiveness?" "I quit! I warned you! I told you I work for profit, and I won't be robbed! I'll never work for you again!" "Forget it. I'll never work for you again." "For 250 gold I'll serve as bodyguard and companion for 30 days. I'm strong, and I don't mind heavy loads. I'm healthy, and quick to heal. Heal me if you can --keep me healthy, and you'll get your money's worth. But I won't stand for any abuse. I work for profit. I've got my own gear and gold. If you ever leave me with less Profit than my own gear and gold, then I quit immediately, and never work for you again." Sounds good. Here's your 250 gold. [250 Gold has been removed from your inventory.] "Good. Our contract is for 30 days. Here are the terms. I follow you everywhere, and fight when you fight. I'm always on duty. I follow or stay, at your command. And you'll keep me healthy and safe, if you want to get your money's worth. If you want to change the plan, just talk to me about it." "I've worked for you, and liked the experience. Same terms as before -- keep me healthy, and you won't regret it. But I won't stand for any abuse. If my profit ever drops below zero, I quit immediately." "Well... not right now, actually. Because I'm working for you. Remember?" Black Dart Gang: "They're deadly. They look like harmless beggars, and they hang out in the sewers, waiting to ambush some careless adventurer struggling out of the ruins loaded with loot. They use darts -- deadly poisons, enchantments, I don't know -- never heard of anything so evil. If you see one, you better run, fast, and carry cure poison and dispel potions." Wait here for me. "Fine. I'll wait here for you." Follow me, and watch my back. "Lead on. I'm with you." "Right. As your mercenary, I follow or stay, at your command. If I'm working for you, when you want to change the plan, just talk to me about it." "I have no current contract." "Our contract is for 30 days, starting %contractCalvusMonth / %contractCalvusDay. You have %Contract_Calvus_Days_Left days left in the contract." "Make sure you collect all your own gear from me before my contract expires. After my contract expires, you can't add or remove things from my inventory any more. Unless you rehire me for a new contract, of course." improve my effectiveness: "If you want better performance, give me better gear. Think of it as an investment in your future. I'm skilled with long blades and blunt weapons, and trained with shield, heavy armor, and medium armor." "Use a 'Heal Other' spell to heal my wounds. You can give me healing potions, but I won't use them except when I'm in combat. I'll rest when you rest, and restore my health and fatigue when you rest. The bottom line is that I have to depend on you to keep me alive. But you'll regret it if your faithful mercenary dies because of your carelessness and neglect... not to mention how disappointed I'll be." "My injuries are serious. Use a 'Heal Other' spell to heal my wounds, or you'll be losing me -- permanently. Or rest, and give me a chance to rest, too, and restore my health." "My injuries are VERY serious. Use a 'Heal Other' spell to heal my wounds, or you'll be losing me -- permanently. Or rest, and give me a chance to rest, too, and restore my health." latest rumors: [Disposition ≥ 30.] "What's the most dangerous thing in Mournhold? Apart from Helseth's Royal Guards and the Hands of Almalexia -- which you've got no business fooling with anyway -- I'd say the Black Dart Gang. I've had no experience with them, personally, but from what I hear, they are really bad news." little advice: "If you're looking for excitement and loot, try the sewers. The residential and the Temple sewers are two completely separate drainage systems. Use grates in Godsreach and the Great Bazaar to reach the residential sewers -- and also in the Royal Palace, I've heard. I don't know about the Temple system -- probably in the Temple itself. The poor and the lawless live under the city, %PCName. It's dangerous -- but it's the only way to reach the ruins of Old Mournhold, where the real treasure lies." little secret: "Modern Mournhold is built upon the ruins of Old Mournhold. At the end of the First Era, Mournhold was destroyed by Mehrunes Dagon. Sotha Sil and Almalexia arrived and drove Mehrunes Dagon back into Oblivion, but the city already lay in ruins. You can reach the abandoned passages of Old Mournhold through the sewers beneath Mournhold, and adventurers still seek lost treasures in the First Era ruins." profit: "I am in this for the money. I won't be robbed. I start with gear worth 500 gold, and with the 250 gold you're paying me. As long as I always have at least that much in gold and goods, I'll serve you according to contract. But if you take any gear or gold from me, I quit. You can take gold or goods from me -- but ONLY if you are replacing it with other gold and goods so my gear and gold are worth 750." Calvus can easily get trapped, so don't take him to places which are hard for NPCs to navigate, such as Bamz-Amschend. If you cast Levitate on him, he will not leave ground level. Due to speed drops and weight issues, Medium armor such as the Ice/Stalhrim set seem to benefit him the most. Allowing him to both keep up with you and stay good and healthy. You can re-hire him immediately after his contract expires, and any items you gave him will still be in his inventory. Calvus cannot travel to Vvardenfell, nor will he travel with you if you cast a Recall, Divine Intervention, or Almsivi Intervention spell. Items with constant effect enchantments can cause various problems, or even work in reverse. In general, armor and clothing are always equipped. Due to a bug, these enchantments will be applied until they roll over to either a negative number (CE strength for example) or 0 (CE feather). This can be problematic if his current load is close to his maximum. Opening the shared inventory and removing a constant effect enchanted item, closing, then reopening and giving it back to him will restart all enchantments. Certain constant effect spells, for example a robe with resist fire, can quickly get him killed. Giving Calvus a cast on strike weapon enchanted with a Restore Health on self effect will allow him to heal himself during combat. Restore Fatigue, Absorb Health and Absorb Fatigue are also useful for this purpose. During An Attack on Mournhold, you will be unable to speak to Calvus, as he will give you the same generic response as any other NPC. You can bribe Calvus and remove the gold added to his inventory without any drop in disposition. Calvus is a highly useful quest and lore tool, and can inform you of, and direct you to, certain objectives to the extent a standard NPC can. This usefulness is multiplied if he likes you. Calvus will attack you if you assault a creature you summoned in front of him. If you save during combat and then load that save, after finishing combat Calvus will stop moving, and the battle music will continue. To rectify this, simply enter dialogue with him and after exiting he will begin following you again. Occasionally, Calvus will not sheathe his weapon after combat has finished. To fix this, simply remove the weapon from his inventory through companion share and then add it again. 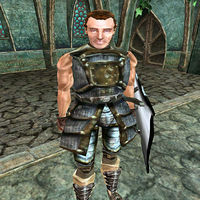 Calvus can be taken to Vvardenfell by exploiting the fact that followers will travel with you when using transport. See the glitches page. ?